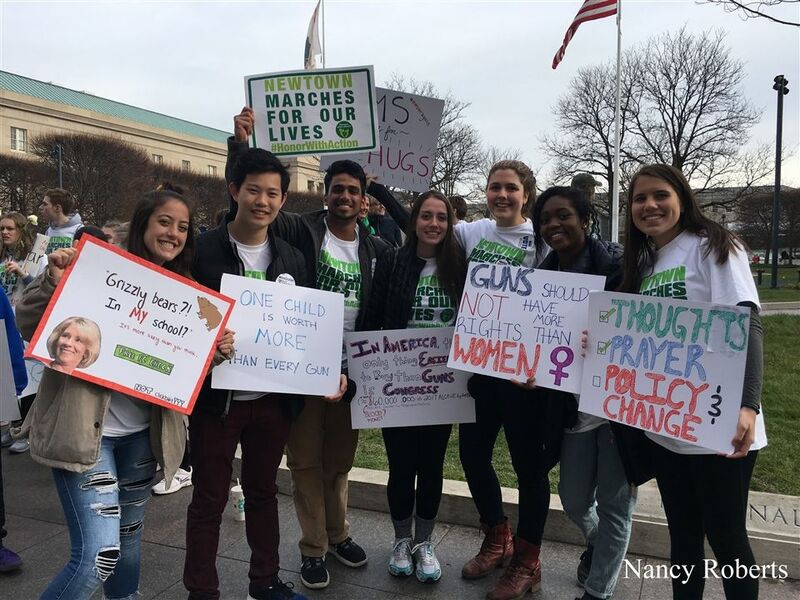 Naomi Roberts '18, Jeff Gu '18, Avi Bhaya '18, Jenn Horkovich '18, Georgia Doolittle '18, Donasia Gray '18, and Sarah Roberts '20 participate in the March for Our Lives in Washington, D.C.
On March 24, hundreds of thousands of people across the country marched together in solidarity with the student survivors and activists from the shooting at Marjory Stoneman Douglas High School in Parkland, Florida, that killed 17 students. All of these individual marches were subsidiary to the massive March for Our Lives on Washington, with over 200,000 people in attendance. In memory of all students wounded and killed as a result of gun violence, many schools participated in a nationwide walkout on April 20, the nineteenth anniversary of the Columbine shooting. Hopkins hosted an all-school Assembly on this day to provide the community with an opportunity to openly talk about the issues at hand. In a recent survey of 150 Hopkins students and 50 staff members, over 20 percent reported attending one of the various marches that occurred in March, in local locations such as Guilford, New York City, and Hartford, marches in other states such as California and Vermont, and even the largest march in Washington, D.C..
Emilie Harris, a science teacher, fencing coach, and advisor for the Class of 2020, attended a rally in Montpelier, Vermont, with her cousin and her aunt, who had been a special educator for 40 years. “For me,” she explained, “one of the biggest reasons I felt I needed to attend was this question: how can I stand in front of my students who are asking for improvements in gun control that I believe in if I just sit idle?” She also noted the remarkable sense of community she felt at the march, in a place where she knew no one but her two family members. “Had I marched at home, it would have been a sense of community with a large number of people that I knew,” emphasized Harris. 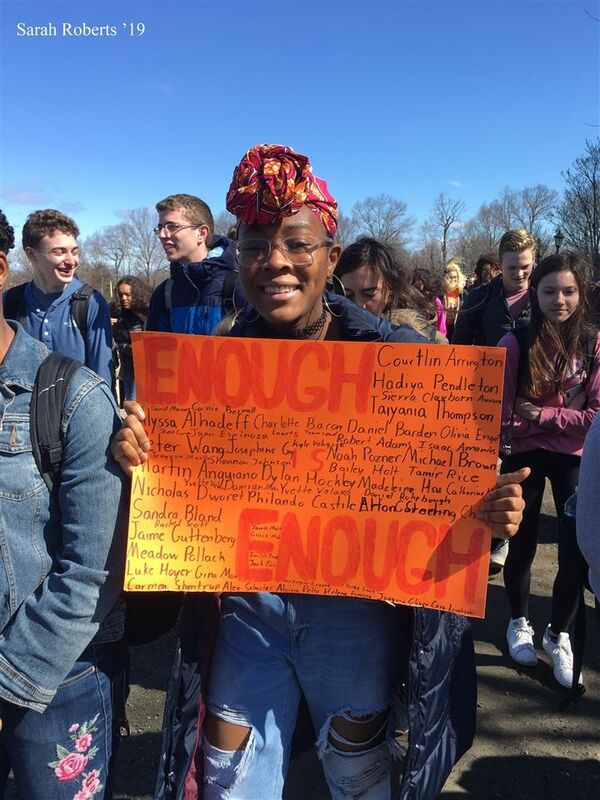 Khelan Parikh ’20 explained that the march had a personal significance for himself and the rest of the people in Guilford, Connecticut. “In my town just a few weeks before, a young freshman was shot and killed at his friends house by accident. This horrific tragedy brought the issue close to home. You could feel that everybody’s passionate voices and signs came from a feeling of utter sorrow and despair. You could tell that my whole town internalized the issue, which made for a very powerful march." The committee made clear that the main goal was to look at the past mistakes during the Conversation on Race and the Talk About Hate to focus on how the discussion could stay away from forcing a conversation and instead create a platform for all voices. Jorgensen emphasized that it was a very deliberate decision that the Assembly focused on gun violence instead of gun control. In today’s political climate, many students recognize the importance of allowing people on both sides of any issue to speak their minds. To facilitate this, Horkovich went directly to people with more unpopular views to ask them what they thought of the committee’s ideas, which is how Mack Reiferson ’18 ended up on the committee and the discussion table during the walkout was formed. “I am certainly one of the voices who isn’t heard from too much at Hopkins so they sought me out to basically serve as a bridge to the people whose voices tend not to be heard” Reiferson added. Reiferson explained that the committee attempted many strategies to create an open dialogue. Although it was under consideration in the first few weeks of planning, it was decided that no outside speakers would be asked to come to the Assembly. Reiferson explained that the purpose of this was “to eliminate the aspect of authority but rather move to a dialogue between students.” Instead, the committee sent an email to the entire Hopkins community, asking for submissions from people who wanted to speak in the Assembly. “We were fortunate enough to be able to put in all of the pieces we were given, so the balance that occurred was natural, which was really cool to see,” emphasized Horkovich. On April 20, Assembly kicked off at nine in the morning with an introduction from Horkovich and Walker followed by a history of gun legislation given by Sophie Sonnenfeld ’21 and Ella Zuse ’21, an original poem titled “Shot Heard ‘Round the Nation,” by Miya Segal ’21, a history of the second amendment given by Ben Nields ’19, “Blowin’ in the Wind,” by Bob Dylan, performed by Ashley Chin ‘19, Alexis Chang ‘21 and Lucy Panagos ‘20, a speech from Prairie Resch ’21 about her experience at the march, a speech on the statistics of gun violence from Sonni Fitzsimonds ’18, an original poem “On October 25, A School Demolished,” by Kyle Burton ‘18 read by Naomi Tomlin ‘19, “None of this is Normal,” by Jenna Harris, read by Dania Zein ’21, and two speeches from members of the Sandy Hook community, Bhaya and Geneva Cunningham ’21. After the conclusion of Assembly, a half hour period of unstructured time, allowed students to participate in the national walkout from 10:00 to 10:17, engage in discussion at the table on the Big H, or take some time to think. Kyle Burton ’18 knew from the start that he wanted to participate in the Assembly in some way, noting that he feels very strongly about the issue of gun violence. “The poem was mostly inspired by a conversation I had with my aunt. She said she was so in awe of the students who marched but that when Sandy Hook happened, those who would have stood up were mothers and fathers were so hurt and grieving that they didn’t have it in them to start the movement that’s getting traction right now.” He continued, “I didn’t think it was right to ignore their importance to this movement, so I wrote a poem based on this half of an essay, and it looked into this idea of a grieving mother.